Millions of exhaust systems are replaced every year due to corrosion and poor performance. Automotive exhaust gases attack the system from the inside out while vibration, chemicals, road salt and other harsh conditions attack from the outside. When you think about all the stress your exhaust system goes through, it's easy to see why you need a Borla stainless steel system! Borla's world-class build quality and performance gains are considered by many to be an outstanding investment. And Borla's One Million Mile Warranty is proof that they take their products very seriously. Cat-Back Systems include the connection pipe(s), muffler(s), tip(s) and necessary mounting hardware. ATAK Mufflers - Acoustically Tuned Applied Kinetics, deliver the highest, super aggressive, available dB (decibel) levels in the BORLA street exhaust lineup. S-Type Mufflers - Straight Through Power, delivers the intoxicating, aggressive, Borla's “Sound of Power”. 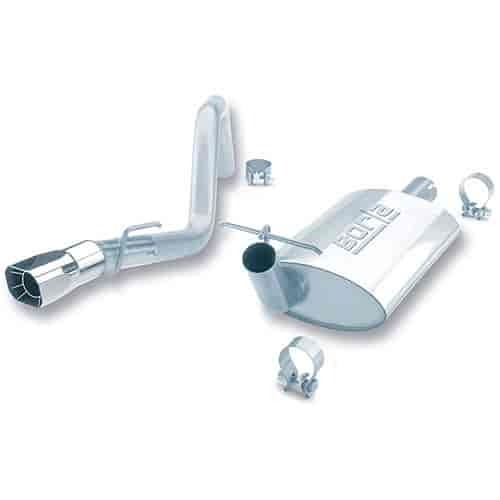 Touring Mufflers - High Performance Without The Roar, delivers a sound that is deep and throaty, but just slightly louder than stock at open throttle. Does Borla 14364 fit your vehicle?